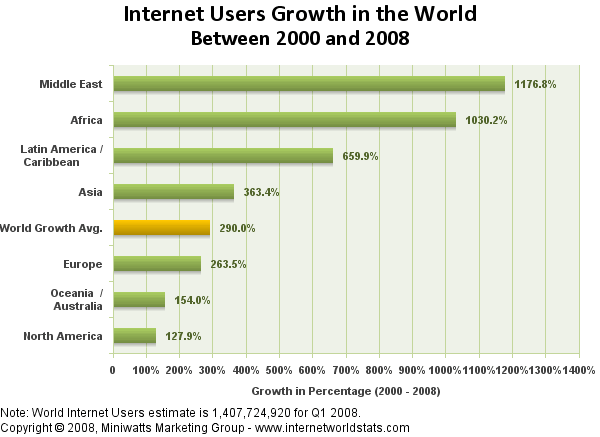 According to a recent report by Juniper research, a quarter of the Earth's population will be online by 2012. This will certainly be a great accomplishment and will measurably improve the quality of life for nearly two billion people. But it's still only 25% of Earth's population. 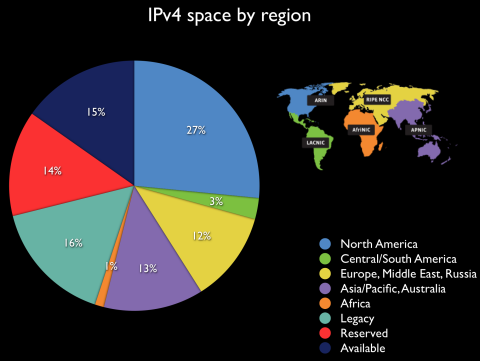 And by 2012, the IPv4 address space will almost certainly all be used up. Today, only 15% of it is left. 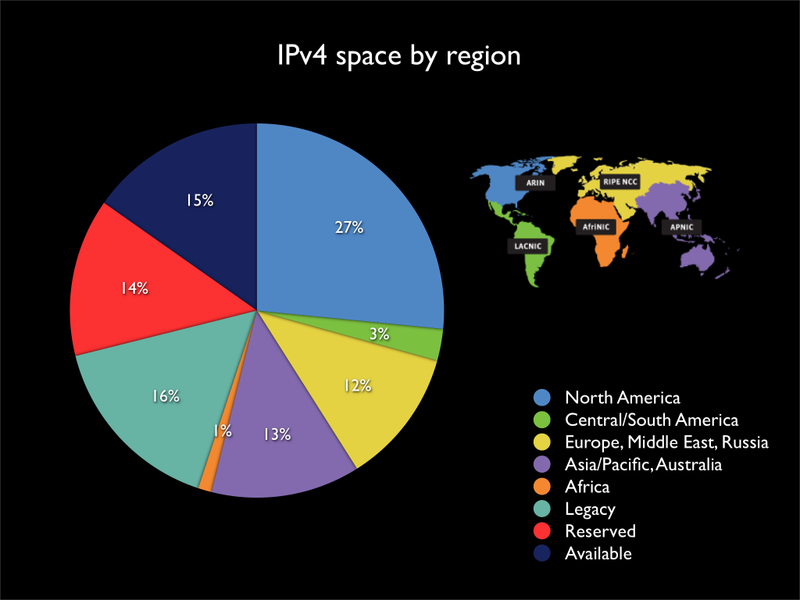 There are just under 4.3 billion possible addresses in IPv4, of which 86% (3.7 billion) are available for common use (the rest are reserved for special use cases). 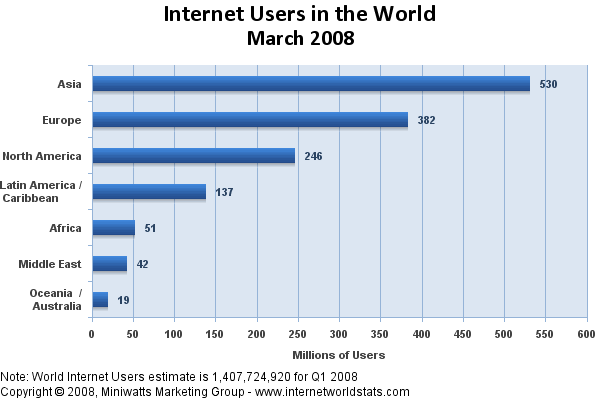 So by 2012, 1.8 billion people will be using 3.7 billion addresses, or roughly 2 addresses per person. And that's before the widescale deployment of 3- and 4G cell phones, which will put even more pressure on the address space (4G cell phones will operate exclusively over IP). This "plethora of addresses" isn't sustainable with IPv4. There are nearly 6.7 billion people on Earth. If less than a quarter of them are using 2 addresses per person, we'll need more than 13 billion IPv4 addresses to give everyone the same amount. But we don't have that many. Not even close. These are percentages of the absolute number of IP addresses. They're not adjusted based on population. I have serious concerns about the ability of developing nations to participate in a 21st-century economy with so few IP addresses per person. To me, the distribution of IP addresses (and, hence, internet access) isn't just a technical problem; it's a social justice issue as well. How are we going to get the remaining 75% of the people on the planet online? Are they going to have publicly routable addresses, or are we going to stick them behind multi-layer NAT and proxy servers, effectively relgating them to second-class status? Still, it's not possible for Africa and South America to achieve address-per-capita rates comparable to Asia, let alone North America, with IPv4. There just isn't enough space left. IPv6 is the only real solution to this problem. Listed below are links to blogs that reference this entry: IPv6 as a social justice issue. This will cause some problems for the ISPs I suppose, who are yet too lazy to deploy IPv6 widely. Tunnelling over IPv4 might be a good "training" for administrators how to handle IPv6 on client machines, but it's not a solution to shrinking address space, either.